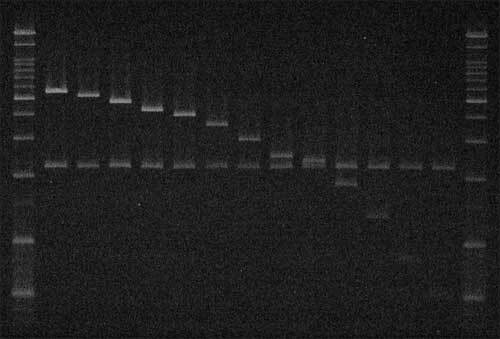 Alpha-satellite DNA (AS) is a main DNA component of primate centromeres, consisting of tandemly repeated units of ~170 bp. The AS of humans contains sequences organized into higher-order repeat (HOR) structures, in which a block of multiple repeat units forms a larger repeat unit and the larger units are repeated tandemly. The presence of HOR in AS is widely thought to be unique to hominids (family Hominidae; humans and great apes). Recently, we have identified an HOR-containing AS in the siamang, which is a small ape species belonging to the genus Symphalangus in the family Hylobatidae. This result supports the view that HOR in AS is an attribute of hominoids (superfamily Hominoidea) rather than hominids. A single example is, however, not sufficient for discussion of the evolutionary origin of HOR-containing AS. In the present study, we developed an efficient method for detecting signs of large-scale HOR and demonstrated HOR of AS in all the three other genera. Thus, AS organized into HOR occurs widely in hominoids. Our results indicate that (i) HOR-containing AS was present in the last common ancestor of hominoids or (ii) HOR-containing AS emerged independently in most or all basal branches of hominoids. We have also confirmed HOR occurrence in centromeric AS in the Hylobatidae family, which remained unclear in our previous study because of the existence of AS in subtelomeric regions, in addition to centromeres, of siamang chromosomes.